TAIPEI CITY –The 29th Summer Universiade Opening Ceremony on 19 August was a celebration fit for one of the planet’s biggest events. 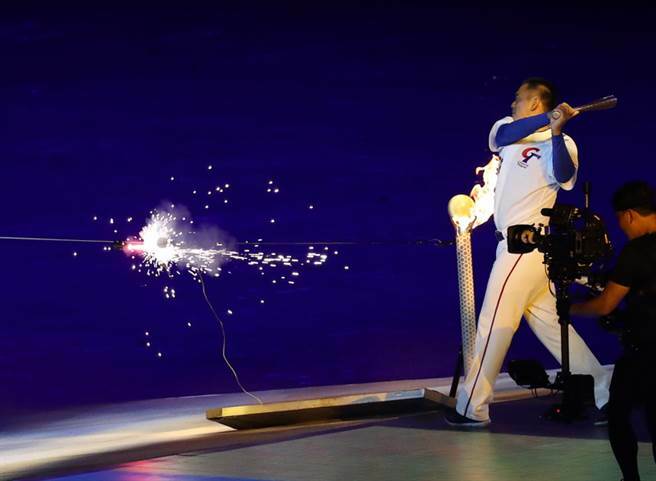 With 22 sports being featured at the Taipei 2017 FISU Universiade and baseball being the most popular sport in Taiwan, hosts turned to retired baseball star Chen Chin-Feng to officially open the games. On the international stage, his career saw him play for the Chinese Taipei National Team in the Olympics, Baseball World Cup and Asian Games. Chen was the first Taiwan-born player to break into Major League Baseball. The Universiade’s baseball competition kicked off at Tianmu Baseball Stadium, with Chinese Taipei pitted against France. The host team led the entire game up until the ninth inning, when a rattled bullpen resulted in consecutive hits from the French side. A walk-off error by the center fielder led to France taking three runs, delivering a bitter 3-4 loss to Chinese Taipei. All 7,800 tickets — including those sold on-site and through preorder — had been sold for the game. Fans cheered raucously for the host team in the packed stadium, and Taipei City Mayor Ko Wen-je also showed up to open the game with a pitch sent right into the catcher’s mitt. The crowd erupted in applause and, with that, the baseball competition for this year’s Universiade had officially begun. Chinese Taipei sent out its trump card, left-handed pitcher Lu Yen-ching, to open the game. Lu also started for Chinese Taipei in its opening game at the last Summer Universiade in Gwangju. Meanwhile, France’s first batter up was Owen Ozanich, who previously played for the European All Star Team and came to Taiwan to compete in the Asia Baseball Winter League. Neither team put a run on the board in the first four innings. The game remained scoreless until the first half of the fifth, when after two strikes, Chinese Taipei’s Chen Chung-ting and Wang Cheng-tang both scored hits. A well-timed hit from captain Chen Chung-yu followed, bagging the team its first run. In the eighth inning, Chinese Taipei stepped up its offense, with Chen Chung-yu making a hit and taking a base. Relying on stealing and taking advantage of a wild pitch, Chen took third base. This was followed up by a two-base hit from Su Chih-chieh, sending home Chen for the team’s second run. The third came with a walk from Chang Min-hsun. Chinese Taipei’s starting pitcher Lu performed admirably, pitching six innings with four hits and 12 strikeouts — and giving up no runs. France was pinned down throughout the first eight innings, unable to get on the board. But things changed quickly after the team’s first run. The team racked up two strikes, a free pass and three hits, leaving Chinese Taipei rattled. Capitalizing on this, France smacked a fly ball into center field, where Chinese Taipei made an ill-timed walk-off error, handing France the game. Japan won over Russia 19-0 in fifth inning at Hsinchu Stadium, USA beat Mexico 3-2 and Czech Republic defeated Korea 4-3.